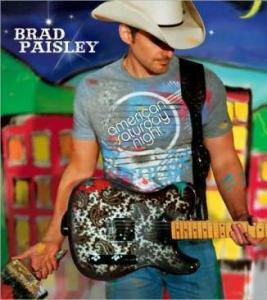 “American Saturday Night,’’ Brad Paisley’s eighth studio record, isn’t technically a concept album, but it captures all the spirited emotions, from thrilling highs to rock-bottom lows, such an evening often entails. A decade into his career, Paisley has grown into a welcome addition to the contemporary country canon, a major star with an understated delivery and an enlightened songwriting perspective. He’s quickly becoming his generation’s George Strait; he’s just short a few dozen No. 1 hits. On “American Saturday Night,’’ more than on his previous efforts, there’s an easy charm to the songs that suggests Paisley relished recording them. It’s hard to remember the last time a Top 40 country album was so relaxed and shuffling yet still powerfully resonant and intimate. Crafting a sense of dynamics - both in his storytelling and the arrangements - has long been one of Paisley’s strengths. “American Saturday Night’’ continues that streak with meaty guitar solos punctuating the twangy melodies and extended instrumental passages closing out several of the songs. It’s very much a smartly produced album that, while adhering to the blueprint for commercial-radio country music, successfully lassos a loose party vibe. Snatches of background chatter - either real or a studio creation - creep into “Everybody’s Here’’ and the title track, and the hard-charging “Catch All the Fish’’ (“gonna drink all the beer,’’ goes the chorus) morphs into a rousing good-time anthem with Paisley locked in a call-and-response with a choir of dudes who sound like they’re huddled together with Miller Lites in hand. “Welcome to the Future,’’ no doubt the boldest song on the album, defies stereotypes about country musicians and their politics. It marvels at the social change afoot since the election of Barack Obama (sample line: “Hey, wake up, Martin Luther/ Welcome to the future’’), and it’s sonically interesting, too, with subtle washes of gurgling synthesizers amid the fiddles and electric guitar. Welcome to the future . . . of country music.